That's what it should say. EA’s free Theme Park game for iOS broke down yesterday, and gamers were unable to access the parks they’d spent time building. The company managed to get everything working again, but once the game was back online, users found that all of their progress had been wiped. The parks they’d build, the achievements they’d earned, and worse, the items they’d bought using in-app purchases were gone. Just like many others here, they Wiped out my park and started me over. I had made it to level 20 I think, and ironically had just spent $25 of real money on the game. Hours later game was gone. It seems like after other people have lost their game after spending real money??? 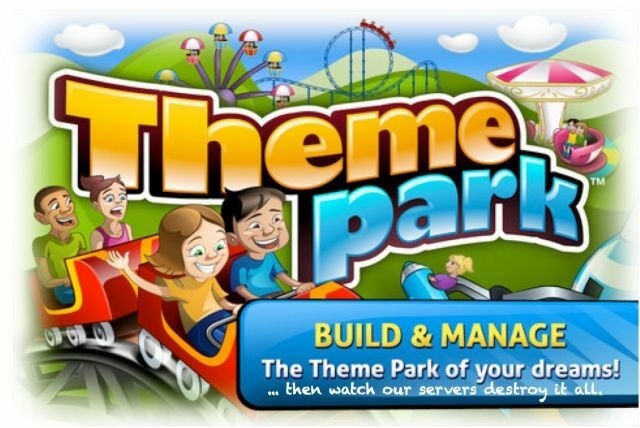 Theme Park is completely free to download and play, but in order to gain certain items — or to progress quickly — users can use their hard-earned cash on in-app purchases, which range in price from $1.99 to $14.99. EA is yet to make a statement on the issue, so it’s unclear whether player progress can be restored, or whether those who made in-app purchases will be compensated. The company is remaining very quiet at this point, but hopefully that won’t last too long. This isn’t the first time EA’s server problems has spoiled its iOS games. Shortly after releasing Battlefield 3: Aftershock, an online multiplayer first-person shooter, EA pulled the title and announced it would not return because its servers simply made it unplayable. A similar situation plagued with The Simpsons: Tapped Out, another free title that allows gamers to build their own Springfield from scratch. Unlike Battlefield, this did return after several months away from the App Store. Server problems like this are surprising when it comes to a company like EA, which is a behemoth in the gaming industry.